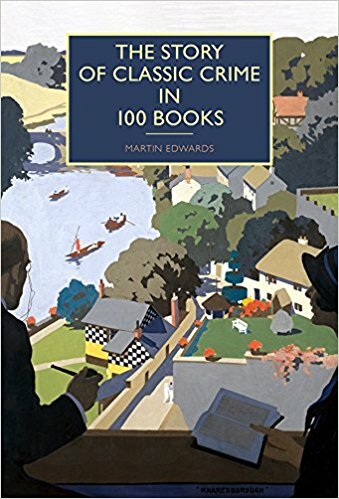 The Story of Classic Crime in 100 Books features on the newly announced shortlist for the Agatha award for best non-fiction book, and naturally I'm pleased, as well as grateful to those who have put the book forward for consideration. I was conscious that The Golden Age of Murder was potentially a once-in-a-lifetime book, and that there was a risk if I ventured into non-fiction about the genre again, the result would be anti-climactic. But it would be a mistake to be deterred by that sort of thinking, since the aim of writing is to do what you enjoy, and what you hope others may enjoy. And I found the experience of working on the book hugely enjoyable, not least because my British and American publishers are excellent, and I had wonderful support from a number of people, not least Nigel Moss and Barry Pike, whose comments on the draft were enormously helpful. I've had wide-ranging experience of dealing with awards, both in my legal career and as a writer. I've been involved in decisions on awards, notably during the period of about twenty years when I was on the CWA Diamond Dagger sub-committee. My own efforts have appeared on shortlists, and occasionally been successful. And, it goes without saying, the vast majority of my works have not come close to featuring in any awards lists. All this had led me to various opinions about awards. I've sometimes talked to people who develop conspiracy theories about award judging processes, but I tend not to be too sympathetic to these. The reality is that judging awards, or voting for an award, entails a great deal of subjectivity. I can think of many award-winning books that have benefited from good timing as well as intrinsic merit, and that's life. What is the "best"? The novel that I regard as my best got nowhere, in terms of sales or awards, yet three other novels did well. Perhaps that simply means that an author isn't the best judge of his or her own work. In recent years, I've had a lot of good fortune with awards, and maybe that is why I take a fairly relaxed view of these things. But really, lovely as it is to have one's work recognised, it's surely best to strive to be philosophical about awards. What I'd say to any writer at the start of their career is to enjoy the good times, because all writers have plenty of less good times. To be shortlisted for an award is an honour, something to savour. And then what matters is to keep writing, and try to write something even better, whether or not it ever comes close to winning an award. Chloe is a psychological thriller movie, originally released in 2009. It's a remake by Atom Egoyan of a French film called Nathalie, from 2003, which I haven't seen. Chloe benefits from a classy cast, led by Julianne Moore and Liam Neeson. I always enjoy watching Neeson, even though I'm not quite sure whether that's because of his acting skills or simply his charisma. Here, as so often, he plays David, a rumpled but likeable guy, an academic and a specialist in opera. The trouble is, his wife Catherine starts to suspect that he's rather too likeable as far as his students are concerned. Catherine, a rich doctor, throws an extravagant surprise birthday party for David at great expense. Much to her embarrassment, he doesn't show up, because he's missed his flight. But did he miss it to be with someone else? She thinks so, and before long the affluent and seemingly untroubled lifestyle of the couple (and the life of their musical but troubled son Michael) is in serious jeopardy. After an enigmatic and unpredictable opening, Chloe develops into a relatively straightforward thriller. The film critic Roger Ebert is among those who have admired the ambiguity of Chloe's motivation (and it's no accident that the film is named for her) but although I enjoyed the film as a competent thriller, I don't think that it has any great claims to sophistication in terms of writing. But Amanda Seyfried's portrayal of the title character is certainly compelling.. When I blogged about my recent trip to New York City, I mentioned a visit to the Strand Bookstore, a cavernous place on four floors with, so they tell me (and I didn't check) eighteen miles of books. That's a lot of books. There's a rare book room on the top floor, and I looked at several very interesting titles. Among them were a couple of signed books that caught my eye. And one of these had a fascinating inscription. It's my Forgotten Book for today. The author was Rufus King, and the title The Deadly Dove. I have to say that, when the jacket proclaimed that it offered "a sinister mixture of mirth and murder", I had plenty of qualms. Writing a truly successful comic crime novel is very, very difficult. And I didn't even realise that Rufus King did comedy. I'd always thought of him as someone who began as a disciple of S.S. Van Dine before branching out with his Valcour series, an omnibus of which has lurked on my shelves for many years. But I was loving my trip to New York, so in merry mood, I bought the book. I read it very quickly because it's quite short. And that's a good thing, because if there's one type of book that's harder to write than a comic crime novel, it's a long comic crime novel. 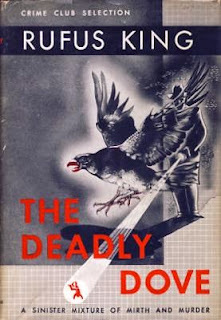 The Deadly Dove was published in 1944, and perhaps it afforded some relief from thoughts of warfare. As a matter of fact, it begins well. The premise is that a grasping young chap called Alan has married an older woman, Christine, for money. Alan owes a gangster $25,000, and the pair of them come to an arrangement. The gangster will arrange for a veteran assassin called Dove to kill Christine. You can guess what's coming, can't you? Yes, that's right. Circumstances change, and Alan becomes desperate to prevent Dove from carrying out his assigned task. But where is Dove? Oh no, he can't be found! The later plot developments became, for me, progressively less gripping, and although King was quite a capable crime writer, this novel is really a minor work. But at least it didn't outstay its welcome as far as I was concerned. Nocturnal Animals is a recent thriller movie written and directed by Tom Ford which has won plaudits in many quarters. It stars Amy Adams as Susan Morrow, a rich art gallery owner based in L.A., and Jake Gyllenhal as her ex-husband Edward Sheffield. So - a top-notch cast. And the premise is interesting, too. Amy has married a second time, and her husband is handsome but untrustworthy. She seems rather discontented with her glamorous lifestyle, and is intrigued when a parcel arrives for her unexpectedly. No, it doesn't contain poisoned chocolates, but rather their modern day equivalent (as in that interesting novel Disclaimer, for instance) - the manuscript of an extremely disturbing novel. It seems to have been written by her ex, Edward. She starts to read the book, and we are plunged into a grim story about a man (also played by Gyllenhal) who is driving with his wife and teenage daughter in a remote part of Texas one evening, when their trip is rudely interrupted by an encounter with a menacing trio of trouble-makers who eventually run them off the road. It's quite clear that Bad Things are going to happen. The film shifts back and forth between the story and Susan's life. This kind of structure is one I find very interesting. And yet. Despite the slickness of the film, I had reservations about it. They began with the opening scene, set at Susan's gallery, where obese naked women are dancing. This felt a bit gratuitous to me, and some other reviewers seem to feel the same way. I also felt that the ending, which many others like, had a "so-what?" quality about it. Overall, despite the film's strengths, I was slightly disappointed. Nocturnal Animals seemed to me like a film that is too clever for its own good. 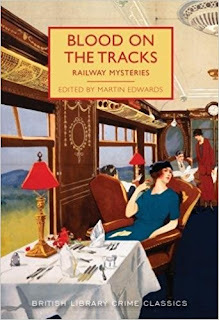 I'm excited about this year's programme for the Crime Classics series published by the British Library. The mix of titles that will appear this year is extremely varied. There should be something, I hope, for everyone who enjoys classic crime. My belief is that variety in a series such as this is essential, just as it is in an anthology. Yes, it means that not everyone will enjoy every story equally. But overall, that scarcely matters, because it also means that readers have the chance to sample writers and styles of writing that are unfamiliar to them, which has to be a good thing. And one of several exciting developments is that 2018 will see the reappearance in mass market paperback of two novels by E.C.R. Lorac. I was first told about Lorac by my parents, when I was young. Both of them liked the books in particular because some of them were set in a part of the country, north west England, which they knew very well. My Dad was a real fan, although I'm not sure he ever cottoned on to the fact that the Lorac pen-name concealed the identity of a woman, Edith Caroline Rivett. But the books were out of print, something my Mum and Dad mourned. So when I started working, and haunting second hand bookshops, I snapped up every Lorac title that I could find, and presented it to my parents. (I did the same with quite a few other authors they liked; I'll say more about those books, some other time.) After their deaths, the books came back to me, and I've slowly been working my way through them, as well as adding some more titles to the collection. 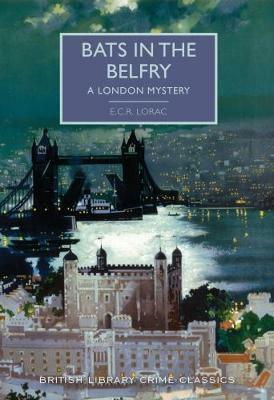 One of the additions I made a couple of years ago was Bats in the Belfry, which is set in central London. I happened to be on holiday in, of all places, the Atacama Desert, when I checked a favourite dealer's site (as you do) and discovered that an inscribed copy was for sale. I nabbed it while still in Chile, on the assumption that I'd never get another chance, even though the book lacked a jacket. And when I read the book, I was delighted, not just by the inscription (to Lorac's mother) but by the story, which struck me as entertaining and atmospheric. Yes, I did guess whodunit, but I felt that the plot overall was pleasing enough for this not to be a problem. Even before I bought that book, I'd been keen for the British Library to bring Lorac's books back into the public eye. But it proved very difficult to trace the rights holders. Finally, thanks to the sterling efforts of Rob Davies's department at the Library, the deed was done, and now Lorac is back in print. Bats in the Belfry was published last week, and another title, Fire in the Thatch, will come out before too long. I'm really pleased about this, and I hope that if you sample Lorac for yourself, you'll find her work enjoyable too. Not long ago, I had the pleasure of meeting Harriett Gilbert, an acclaimed novelist and radio presenter - and also the daughter of one of my long-time favourite crime writers, Michael Gilbert. I invited her to be guest speaker at the Detection Club's most recent dinner, and like all all my colleagues I really enjoyed listening to Harriett talking, with great affection, about her father's work. And this splendid occasion, among other things, has prompted me to revisit several of his books. Close Quarters, first published in 1947, was his first novel. I borrowed it from our local library at a very tender age; more recently, to my delight, I managed to lay my hands on a signed first edition, and because I think lovely books should be read, rather than just gazed at admiringly, I have just re-read it, with much pleasure. The story is set in 1937, and apparently Gilbert wrote it before the Second World War, but his time in service (including a spell as a prisoner of war in Italy) meant that his attempts to establish himself as an author were put on hold until hostilities ceased. Once he'd got into print, however, there was no stopping him, and books and short stories began to flow from his pen. Gilbert's work was exceptionally varied, but this first effort was very definitely in the tradition of the Golden Age whodunit. There is a "closed circle" setting which just happens to be a cathedral close. There's a cast of characters, maps of the close, and even a crossword puzzle which plays a part in the storyline. And Chief Inspector Hazlerigg, who featured in several of Gilbert's later mysteries, makes his debut. As you'd expect from a first novel, this one has some flaws. In particular, I feel that there are too many people - the first chapter introduces them at a rather dizzying rate, and although Gilbert's urbane storytelling style is already in evidence, I shared Hazlerigg's irritation at the fact that a crucial piece of information was kept from him for three days. Nonetheless, an enjoyable book, and the start of an admirable career. Many years later, incidentally, Gilbert returned to Melchester Cathedral for The Black Seraphim, though the later book wasn't a sequel to his debut. I'm just back from a short stay in New York, my third visit to the Big Apple. Each trip has been unforgettable. The first time coincided with the first time I had a novel published in the US - Eve of Destruction. I recall vividly checking into my hotel just off Broadway, then walking towards Central Park only to be lured into a bookstore. Imagine my glee when I was confronted by a huge display of my latest hardback! That hasn't happened too many times in life, I can tell you. The second trip was for the Edgars, two years ago, when The Golden Age of Murder had a lucky night. Very, very memorable. Anyway, I got to the US in good time and had the chance of a "bracing" i.e. very cold walk to the fascinating Strand Bookstore, a huge and impressive place, where I managed to bag a couple of excellent signed books. On the flight I'd watched Goodbye Christopher Robin, and this prompted me to visit the New York Public Library, which is impressive, and boasts among many other treasures the original Winnie-the-Pooh, plus chums such as Piglet and Eeyore, in a glass case, in front of the famous map of the 100 acre wood. The Yale Club proved very atmospheric, and among other things it boasts a fantastic library. I had the chance to attend a range of events, including a Baker Street Journal cocktail party, the main BSI dinner, a fabulous affair, a reception and lunch, a book fair and a private party given by Otto Penzler at the Mysterious Bookshop. 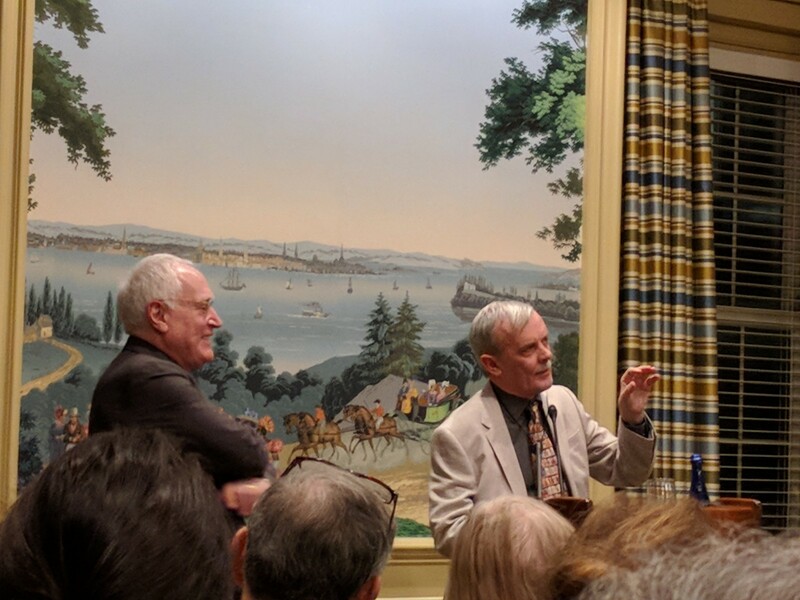 Best of all, I had the chance to meet delightful people, including Mike Whelan, head of the BSI, and Les Klinger who invited me over, as well as many others. My thanks go to Dana Cameron for the photo at the top of this post, taken in the Club when I was fielding questions after my lecture. And then, on my last day, the sun shone (though it was again "bracing") and Michael Dirda and I had brunch together before doing sightseeing stuff at the Rockefeller Center, including a trip to Top of the Rock, with amazing views all around an amazing city. Quiet and understated New York is not, but I had a whale of a time. Web of Evidence is the American title of a 1959 British film which in this country was called Beyond This Place. The screenplay was based on a novel by A.J. Cronin, also called Beyond This Place. Cronin isn't someone I associate with crime writing, and I guess the novel may be a bit more of a mainstream book than a thriller. But he was a good novelist - and the creator of Dr Finlay's Casebook - and I imagine it's worth reading. The film is one of those which grafts American actors on to a British story solely for commercial reasons. Fortunately, in this case the actors are Van Johnson and Vera Miles, both of whom were very capable performers. Oddly enough, the setting is Liverpool, and I was fascinated to see shots of the city as it was in the late Fifties - a much grimmer place than it is today, for sure. Johnson plays Paul Mathry, who docks at Liverpool for a few days in the hope of tracing his father, whom he lost touch with at the start of the war, when his mother took him away to the United States. He is shocked to find that his father (played by Bernard Lee, just before he became "M" in the James Bond films) was convicted of murder, and only escaped the gallows with the help of a campaigner (Emlyn Williams). Johnson decides Dad was innocent, and sets out to prove it. But he faces obstruction from the authorities, who don't want the old case to be re-opened. Vera Miles, a local librarian, helps Johnson in his quest, and naturally they fall for each other. But she too has a secret in her past. I wasn't qutie convinced by some of the legal aspects of the plot, but that didn't matter too much. The quality of the acting (the likes of Leo McKern, Geoffrey Keen and Rosalie Crutchley also appear) coupled with a solid story make this a very watchable film. The story is set in Boston and although the critical consensus is that it's not one of her masterpieces (a view which I share) it is still full of pleasing elements, especially given that McCloy seizes the chance to crack a few jokes about the writing business, and offer a few insights into it. A widow, Harriet Sutton, consults her lawyer about making a fresh start in life. Encouraged by him, she buys a house for herself in a historic neighbourhood, and funds the cost by taking tenants. Because she's a writer, she decides that her tenants should be writers too. However, the tranquillity of her new existence is disturbed when she comes across an anonymous note marked "Burn this". It appears to be a message from one person living in the house to another saying that a fellow tenant is "Nemesis", a critic of legendary virulence, and that "Nemesis" should be given his - or her - final come-uppance. But who wrote the note, who was to receive it, and who is "Nemesis". Harriet mistakenly reveals the existence of the note to her tenants, and chaos ensues, but when murder duly occurs, the victim is unexpected - Harriet's lawyer. Is the death connected with the note? In the second half of the book, the victim's heir introduces Harriet to Basil Willing, who lends the police a hand. I wasn't altogether blown away by the solution to the mystery, which seemed to me to be less interesting that such a tantalising set-up deserved. So it's not vintage McCloy. But it is still decent entertainment, a quick and easy read, though not the best introduction to a fine writer. Even before he became James Bond, Sean Connery was an actor whose performances packed a punch, and in The Frightened City, released in 1961, he gives a notable, and indeed nuanced, performance as a gangster called Paddy Damion. Damion can be brutal, and treats his girlfriend Sadie badly, but he is a good friend, even if he chooses his friends from people he's shared a prison cell with, notably an aged gangster called Alfie, and a former burglar (played by Kenneth Griffiths) who is now disabled..
Damion only comes into the story after an intriguing scenario has been established. Herbert Lom plays Waldo, a sinister accountant, who talks protection racketeer Foulcher (Alfred Marks) into joining forces with other gang leaders to create a reign of terror in London The police, with John Gregson to the fore, are struggling to cope with the menace. But Waldo and Foulcher become greedy, while Damion's wandering eye leads him into trouble when he falls for Waldo's lady friend Anya, played by Yvonne Romain. Romain is convincing as a sultry foreign seductress, so it came as something of a surprise to me to earn that her real name is Yvonne Warren, and she was born in London. She's been married to prolific songwriter Leslie Bricusse from almost sixty years, but the background music in the film is provided by Norrie Paramor and The Shadows. This is a realistic, and occasionally subtle film which is at least a couple of notches above the ordinary in terms of both screenplay (by Leigh Vance) and performances. The focus is more on the villains than the cops (who are not above breaking the law themselves to try to do justice as they see it), and that works pretty well. And the climactic scene in Waldo's exotically furnished home is nicely done. 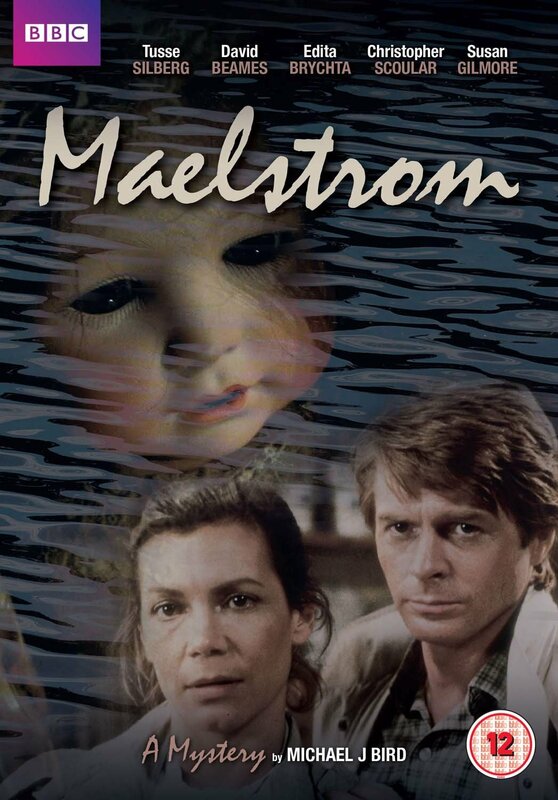 Maelstrom was a six-part BBC series screened in 1985. I didn't see it then, but I'd read good things about it, and I've developed an interest in the writer, Michael J. Bird, who wrote a number of very popular TV series in that era.. So I was delighted to receive the DVD two-disc set as a Christmas present, and quick to watch it. And I found it very enjoyable. In essence, it's a Scandi-crime show written by an Englishman. The premise is interesting. Catherine loses her job only to fall on her feet. A summons to a solicitor's office results in her discovering that she has inherited valuable property in Norway. The benefactor was a wealthy Norwegian, but she knows nothing about him, or why she has been mentioned in his will. She sets off to Alesund to learn more about her inheritance and meets an enigmatic bunch of characters. Most enigmatic of all are the two daughters of her mysterious and recently deceased benefactor, who welcome her warmly (and are wealthy in their own right, so have no need to be jealous of her inheritance). Yet there's something very odd about the situation. And does the local doctor know more than he's letting on? She is befriended by a handsome local journalist, who believes there was somethiing suspicious about her benefactor's death. And what is the secret of the island house she has inherited, where one of the rooms is inexplicably locked, and to which a hundred or so dolls lend a certain spookiness? By the standards of modern TV crime dramas, Maelstrom doesn't move at a fast pace, but the scenery is gorgeous, and the story builds suspense very well. I was interested to study Bird's technique. His plot is sound, and although I figured out the main twist early on, he still kept one surprise up his sleeve. The cast does a decent job, especially Tusse Silberg as Catherine, and Northwich-born Ann Todd, who plays Astrid. And although the creepiness of dolls has been explored in other films and TV shows, Bird uses them very well here in creating a macabre atmosphere. I can recommend this one. Anthony Armstrong is remembered today, if at all, for his play Ten Minute Alibi, the novelisation of which I reviewed earlier this year. Armstrong's real name was George Anthony Armstrong Willis, and he was born in 1897 in British Columbia, the son of a British man who was in the Royal Navy. The family returned to England in 1900, and Armstrong became a successful writer. Among other things, he contributed to the screenplay of Hitchcock's Young and Innocent, a film which renders the source material, Josephine Tey's debut novel, pretty much unrecognisable. Armstrong's career as a novelist was not outstanding, but among other books he wrote a series of five featuring Jimmy Rezaire. Rezaire is one of those characters, like Raffles, who begins life as a crook and ends up on the right side of the law. I recently read The Poison Trail, his final case, in which he is operating as a private investigator on good terms with the police. The Poison Trail isn't a whodunit, but a howdunit. It's fairly clear from the outset that Gideon Davenport killed his brother Abel to inherit a fortune. But what baffles everyone is how he managed it. Richard Marty, who had hoped to inherit instead of Gideon, is frustrated by the inability of the police to nail the killer, and so he consults Rezaire. Rezaire is assisted by his wife Viv and his chum Hyslop, but at first they are confounded by the case. Has Gideon outsmarted them? Armstrong was a readable writer, and although the plot is not over-elaborate, it's quite well-handled. 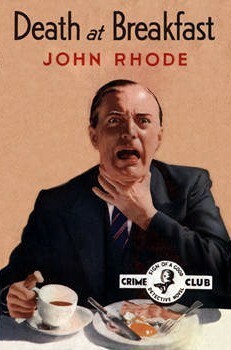 Personally, I prefer more twists than were on offer in The Poison Trail, and the story is told in a slightly boyish way, but it's a competent piece of work, even if a minor one..
John Rhode was probably at the height of his fame when he published Death at Breakfast in 1936. It's long been a hard-to-find novel, but not any more, thanks to a paperback reissue by Harper Collins which uses the splendid (if not quite true to the storyline) original cover artwork. It's another example of a reissue that, a few years ago, would have seemed an impossible dream. But is it any good? Well, yes, I think it is. 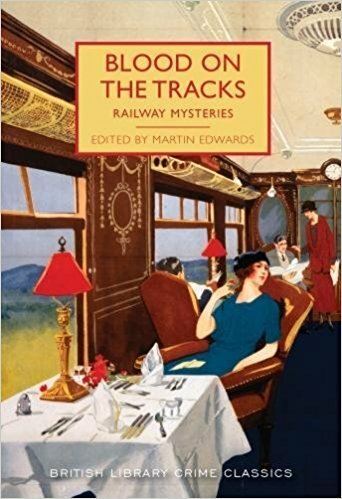 This isn't an entry in the publishers' Detective Story Club, so there is no introduction, but there is a prologue - not a device that Rhode commonly used, I believe, though I have to say that there are over 100 of his detective novels that I haven't read. We're introduced tot he miserly and unpleasant Victor, who is anticipating some kind of mysterious windfall. Suffice to say, the reader is not heartbroken when Victor quickly meets his death as a result of nicotine poisoning. At first, suspicion falls on his half-sister and her brother. But soon it becomes clear that the mystery is more complex than seemed to be the case. Superintendent Hanslet and young Jimmy Waghorn make a nicely contrasted pair of detectives, but for all their talents, they find it necessary to consult Dr Lancelot Priestley when the puzzle become hard to solve. Hanslet is not impressed by some of Priestley's reasoning, and naively concludes that the great man, who is getting on in years, may be losing his grip. Nothing, of course, could be further from the truth. I figured out the central trick in the story quite some time before the two cops, but that didn't much lessen my pleasure in an entertaining mystery. Rhode was a capable craftsman, and he built his plots with care. This is a pretty good one.